The U.S. economy limped into 2006, growing at slower-than-expected 1.1 percent pace in the fourth quarter as consumers spent at the slowest pace since 2001 and corporations limited equipment purchases. There are two main factors associated with the high volatility of recent GDP growth: (1) Hurricane Katrina and (2) defense spending. Remember that GDP is Gross Domestic Product, meaning that if our economy is just replacing capital destroyed by Katrina, gross production will increase. 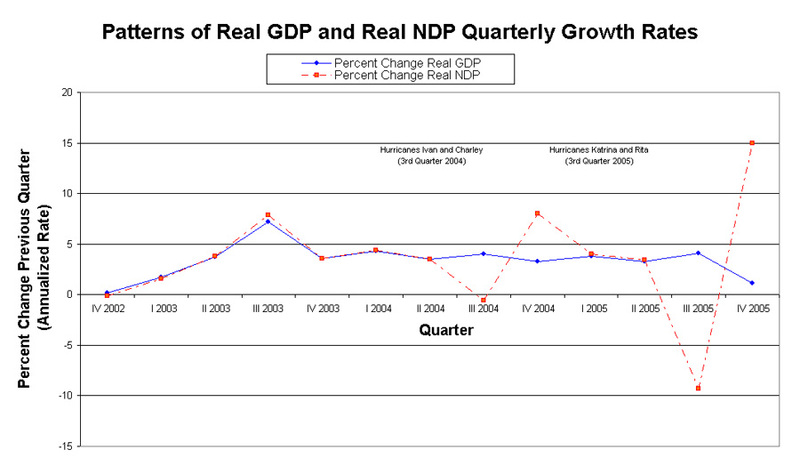 But also during Katrina, federal defense spending—part of the government portion of GDP—rose dramatically. Defense spending includes much of the costs to government from hurricane relief (see this MSNBC article detailing Katrina relief spending in the defense bill). Specifically, defense spending rose 10 percent in the 3rd quarter, only to fall 13.1 percent in the 4th quarter. That means the 3rd quarter GDP number was “artificially” high thanks to these added costs of rebuilding and spending, and the percent change in the 4th quarter was “artificially” low as spending and rebuilding subsided. If, on the other hand, we examine Net Domestic Product (NDP)—which accounts for huge capital stock losses from natural disasters—one can see a much different picture of the recent economy. Real NDP fell dramatically in the 3rd quarter—a 9.3 percent annualized decline—but rose dramatically in the 4th quarter by 15 percent. Contrast that with GDP, which increased at a rapid pace of 4.1 percent in the 3rd quarter, yet only rose by 1.1 percent in the 4th quarter. Take a look at the chart below of the quarterly growth rates in GDP and NDP since 2003 and the timing of when the two indicators diverge. The first large divergence comes in the 3rd quarter of 2004 (hurricane season) when we saw the destruction caused by Hurricanes Ivan and Charley. During the 3rd quarter of 2004, defense spending rose by 9.0 percent, spiked by the hurricane relief expenses, and then only fell by 3.3 percent in the 4th quarter. The second large divergence between the two indicators appeared in the 3rd quarter of 2005 with Hurricanes Katrina and Rita. Notice too from the chart that this phenomenon does not occur in 2003 as its hurricane season was very light relative to other years. Hurricane Isabel was the only big storm of the 2003 season and only struck land as a Category 2 storm.